Last year, a record 4.1 billion passengers took flights between cities, indicating a 7.3 percent year-on-year growth. With the increasing number of passengers and the rapid pace at which technical innovation is unfolding, the aviation industry is expected to adapt to ensure a simple and efficient travel experience for all travellers. While some airports have already embraced this digital transformation, passengers too have shown willingness to adapt. Over 65 percent of passengers incline towards sharing additional personal information to speed up their processing at the airport. Speed and convenience are paramount. We’re optimistic airports will soon meet these expectations; not forgetting the ones that are already making progress. There are a few technologies that are specially designed to facilitate a seamless journey for air travellers while also ensuring appropriate levels of security. Here are a few aviation security trends that will take shape in 2019 and beyond. Originally intended for medical applications, computed tomography (CT) technology was first used in hold baggage security systems in the early 1990s. Today, regulatory and technological advancements have made it possible for this technology to be adapted for cabin baggage screening too. The process incorporating this technology will significantly improve queuing time at airports as it will speed up security screening at checkpoints. By installing certified equipment, airports can allow passengers (subject to approval from the appropriate local authorities) to retain liquids and electronic items in their hand luggage. For passengers, this translates into quicker security checks; and for airports, this is an opportunity to alter the divestment process, thus decreasing the complexity of the passenger’s journey. This change in technology offers the chance to improve both the effectiveness and efficiency of the screening process. By utilising CT technology and automation, airports will be able to ensure they are working at their most efficient level at all times. Given the benefits, we anticipate seeing this technology being rolled out further in airports globally throughout 2019. In a 2018 study from Research and Markets, the use of artificial intelligence (AI) in the global aviation sector is predicted to reach $152.4 million USD this year, and is likely to reach $2.2 billion USD by 2025. The reason for this evolution is the growing use of data and cloud computing by airports to support their operations. The availability of digital data and the computing power to process it means analysis techniques – using artificial intelligence – can also be applied to improve current screening equipment performance. This allows the deployment of new functions such as battery detection in cargo and weapon detection at the checkpoint that are increasingly effective and reliable. The improvements in performance of biometric technologies have also been a result of the strides made by AI and the availability of passenger data. This capability will see wider implementation, and will enable instant identity verification throughout the traveller’s journey. Biometric identification removes the need for physical documents and credentials at every touchpoint, promoting a paperless and seamless journey. Biometric enrollment, following passengers’ consent, will remain active in the system for a limited period of time, but will offer opportunities for personalising a journey by providing insights into preferences and behaviours. 2019 will see airports embrace AI to enhance aviation security – of passengers and their baggage as well as cargo. 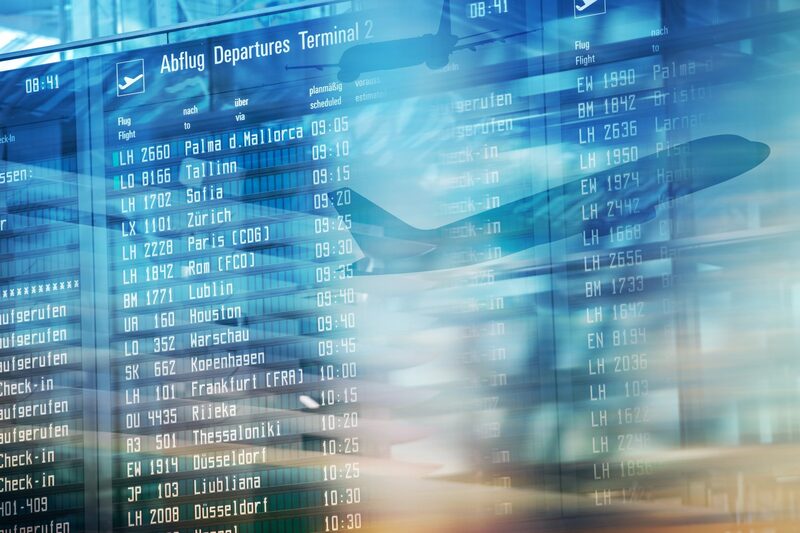 It’s clear that the digital transformation of airports comes with a set of challenges – it needs to be cost-effective, secure, provide the appropriate level of security, and allow airports to cope with the burgeoning passenger and cargo traffic. Airports are increasingly interested in smart security programmes – those that incorporate technical and process innovations. According to a report released by Frost and Sullivan, 40 percent of airports globally intend to deploy biometric-enabled initiatives by 2020. The availability of reliable biometric technologies and AI based analytics can provide insights to help improve the screening process. These insights can be utilised in order to form an enhanced method of screening known as risk-based screening (RBS). The concept of risk-based screening is based on the principle of differentiating passengers and applying appropriate screening protocols to them. This differentiation is based on a ‘risk score’ derived from an analysis of (for instance) their destination or status as a passenger. The Precheck scheme in the US is a form of risk based screening. Future developments will incorporate biometric data and dynamic risk assessment to better inform decisions on appropriate screening measures. In conclusion, the strongest trend we have seen is the harnessing of data to develop increased levels of insights into the passengers and any risk they could pose. This highlights the importance of protecting this data and the networks used to store and process it. Cyber threats and attacks will continue in the years to come, although the threat actors and tactics may change. A joint approach between regulators, airports and suppliers is required to ensure ‘cyber compliant’ equipment is available and that it is deployed and maintained securely to protect the wider aviation network; this approach may require its own form of innovation by the stakeholders. As a leading supplier of security solutions to the aviation sector, we at Smiths Detection work closely with regulatory authorities on compliance requirements for detecting weapons and explosives. We also increasingly support managing risks related to the airport operations once our equipment are networked and consider ourselves at the forefront of technical and process innovation. Kevin Riordan heads the checkpoint solutions team for Smiths Detection. The role is part of the overall strategy & marketing function working closely with Sales, Products & Technology and overall business management, interfaces closely with the customer community and key industry stakeholders in order to develop the sector; providing guidance for product strategy and subject matter expertise to all functions of the business. He has previously worked for a number of UK government departments including the Home Office and the Intelligence & Security Secretariat of the Cabinet Office, responsible for research and development programmes and technical policy development.